Right at the start of Apple‘s iPhone 4.0 event, Steve Jobs revealed the “boom!” many iPhone lovers had been waiting for–multitasking. Jobs laughed off the several years of anti-Apple criticism centering on multitasking by noting that while Apple wasn’t “the first to this party,” it’s definitely “going to be the best.” The system works pretty much how you would expect: That home button gets another function–a double click now activates the multitasking system. This means it doesn’t work through a gesture, like some fans of Mac OS X’s Exposé feature had hoped, but it’s at least a natural activity for anyone familiar with how iPhones work at the moment. While running an app, a double click brings up a bar at the bottom of the screen that looks a lot like (though distinctly different from) the standard four-app iPhone menu bar. It shows which other apps are running at the moment, in addition to the one that’s occupying the main portion of the iPhone’s screen (that app gets bumped upwards a notch by the slide-in multitask window). You then merely switch between the apps with a dab at its icon, and the new app picks up where it left off. Lest you worry that this is merely super-fast app “switching” (with the apps available and not requiring re-logins, to systems like AIM, but actually frozen in place while in the background) then worry not–Jobs demonstrated that Pandora’s streaming audio system happily worked while the app was running behind a different one. And then Apple pulled another magic trick out of his hat…and revealed that Skype VoIP calling works in the background too. This is something of a revelation, since it almost circumvents the cell phone provider’s network. Will it work over 3G? We’re not sure. Will Google Voice arrive, finally, for the iPhone? Nobody knows. Yet. 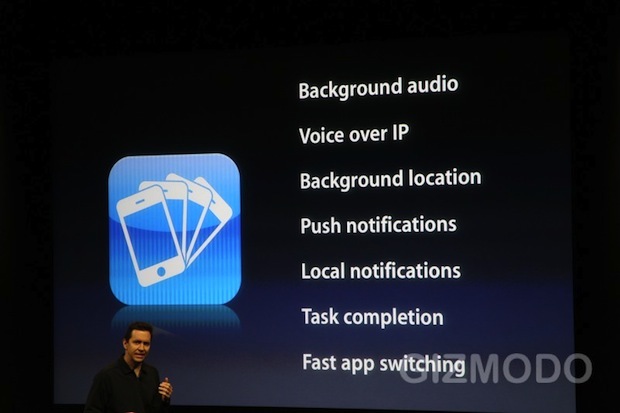 Apple’s SVP of iPhone software Scott Forstall then revealed another massive trick in iPhone multitasking: GPS, or location-awareness. This has obvious utility for anyone who uses the iPhone as a GPS. But the implications for social gaming systems like Foursquare are also massive, as is the ability of, for example, shopping reminder apps to pop up to tell you to buy groceries when you’re near the supermarket. Forstall noted that Apple won’t be playing fast and loose with your location, and that whenever an app is pinging your phone for location data, it’ll give itself away with a special notification in the iPhone menu bar. Is this enough to allay people’s fears? It’s certainly a good step in this direction. Apple’s interim “multitask” push notifications aren’t going away though, as they can still serve an important purpose–letting you know if a backgrounded app has finished uploading or downloading a large file, for example. There’s one more thing to note, which will be criticized by some, but it’s in line with other Apple policies, and we guessed it in our rumor round-up this morning: Apple’s maintaining strict control over multitasking, to prevent security issues or serious battery-sapping going on. There are seven new APIs in the code that allow backgrounding, and even app-to-app interactivity, so full multitasking is restricted. The system is thus 60% multitasking (with the most popular kinds of background activity like continuous audio) and 40% fast task-switching. This will have the Android and Pre fans pointing and laughing, but from a user perspective the experience probably won’t feel restrictive at all…particularly with all the other iPhone tweaks this new software introduces. 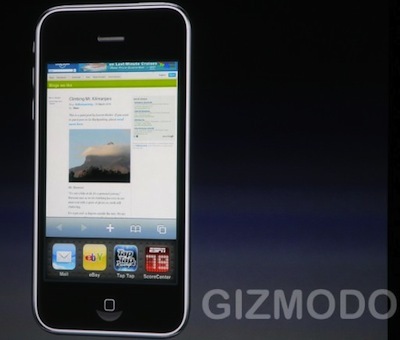 This will only work on the 3GS version of the iPhone and 3rd generation iPod Touch later this summer. And there’s been no specific mention of how multitasking will work on the iPad yet, only that we’ll get more details in the fall. So we’ll step in and say that if it’s this neat on the iPhone, it’ll be transformational on the more powerful tablet PC. To keep up with this news in a more real-time setting (soon on your iPhone while doing something else in another app!) follow me, Kit Eaton, on Twitter. That QR code on the left will take you to my Twitter feed too.